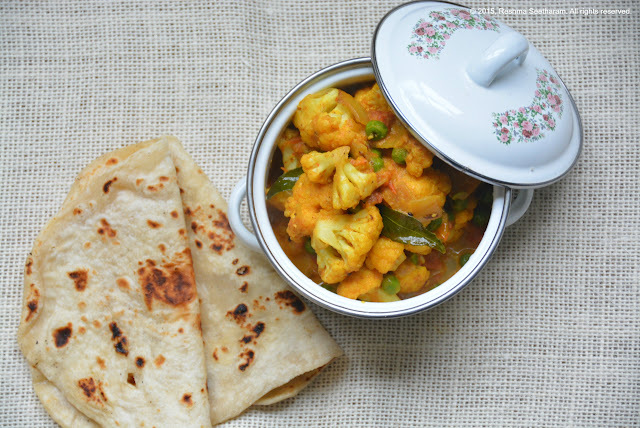 I love this mellow and creamy curry with crunchy cauliflower. Great for dinner or lunch, paired with rice or chapatis. This is a simple curry that complients a variety of Indian brekfast foods like idlis, dosas and pooris. It tastes great with breads too. A South Indian vegetable curry sauteed and simmered in a curry of ground coconut and cumin. 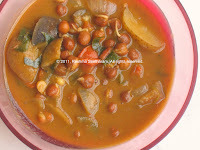 This is a green kidney bean curry that is cooked in a curry or red chilies, potatoes, onions and tomatoes. yet another classic curry made with green bean kidneys that are boiled. The stock is then used as a curry with ground spices. The beans and sauteed with onions into a stir-fry. A green kidney bean and spinach curry blended together in curry. The combination of soy chunks and green kidney beans come well in a thick spicy curry that goes well with rice or flat bread. It can also be described as a red curry made with vegetable stock blended with ground coconut and curry paste. My all time favorite, the classic lentil and vegetable curry cooked and tempered in curry powder, tangy tamarind, mustard seeds and curry leaves. A sunny blend of potatoes, corn and turmeric in a curry that is tempered with spicy green chilies. Indian cheese, green chilies and peas are a great combination when they are blended together in curry and topped off with cream to cut the heat and give it a smooth texture. Tiny purple egg plants stuffed with curry masala, and fried in oil. Then immersed in more curry for added flavor, yum! A soup made with fresh toasted and ground cumina nd pepper seeds, then tempered into a thin lentil stock. A touch of turmaric and tamarind makes this soup a great soother for sore throats and blends well with soft cooked rice. This is a unque curry that is made with whole mentils/beans, and/or vegetables. The vegetable mixture is cooked with chili paste, and then topped off with milk just before serving. Just the right combination to healthy living. 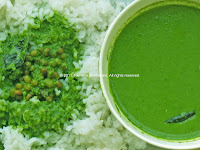 Whole green grams are toasted and cooked with a couple of vegetables and simmered in curry paste. This is a deep green leaf that is boiled and ground to a paste with chilies and spices to form a rich curry. You can diversify the texture and flavor by adding vegetables or whole lentils of your choice. Whole channa with skin is soaked and cooked with potatoes, onions and tomtaoes, then simmered in curry paste, and topped off with a tempering of curry leaves and mustard seeds. This is a wholesome vegetable curry that is cooked with lentils and tempered with spices. Dice your green and vegetables, throw them in with lentls and cook. Then temper it with chilies and fresh crushed garlic. A flavorful curry. Greens and lentils cooked and ground with garlic and chillies to blend together in a fine rich curry. This can be made as thin or as thick as you would like it to be. The thinner runny versions are best used with a few days. The latter can be stored for upto a week or more if stored well. Okra sauteed and immersed in a bubbling curry of fragrant fenugreek masala curry. A wonderful combination. Mushrooms and peas cooked with a ground masala paste. Yet another greens curry , but this one is made with curry powder instead of raw or dried chilies. Indian cheese cooked in a bubbling mixture of fenugreek and whole ground spices. Tiny pearl onions combined in a curry made with tamarind and curry powder, a very simple and mouthwatering dish that tastes best with soft cooked rice and a dollop of clarified butter. Okra sauted and thrown into a simmering mixture of ground masala and red chilies. A simple curry made with lentils, okra and tomatoes with curry powder. Vegetables stir fried and then cooked in a curry of spices and cream. 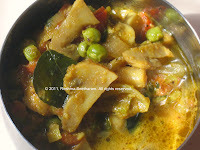 Here is a classic South Indian curry that is made with vegetable stock and a load of green chillies. To bring flavor, garlic, peppers and cumin are used. Indian cheese and corn cooked in a pepper corn and spice masala. As the name suggests, a curry made with all the three in a ground masala paste. Pigeon eyed peas and carrots come together in this spicy curry. Great with flat breads or wit soft piping hot rice.